Federal consumer safety regulators on Thursday formally recalled 1 million Samsung Galaxy Note 7 smartphones after dozens of users reported the device caught fire while charging. The U.S. Consumer Product Safety Commission told customers to "immediately stop using and power down" the device. Samsung (SSNLF) said on September 2 that it would stop selling Galaxy Note 7s. The company has received 92 reports of the batteries overheating in the U.S., including 26 reports of burns and 55 reports of property damage from fires, the CPSC said. 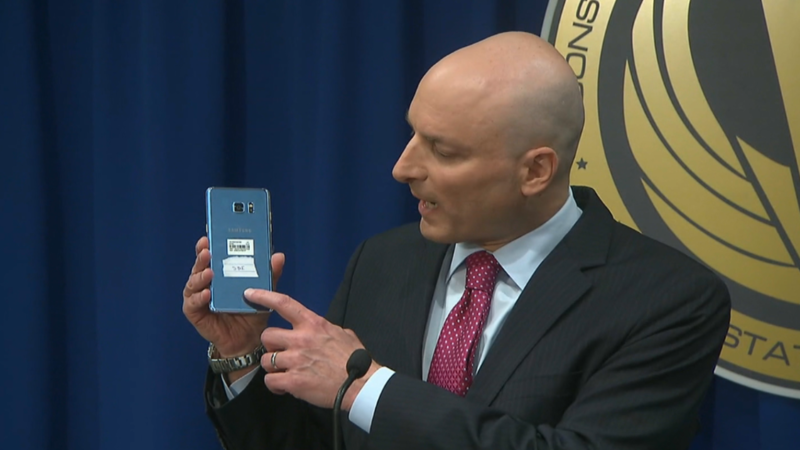 The federal agency says Note 7 users can get a free replacement from Samsung, their wireless carrier or the retail outlet where the bought the phone. The new Note 7 will be in most stores no later than Sept. 21, Samsung said Thursday. Customers can also ask for a refund or a different device. The dangers of using a recalled Note 7 were rare -- its battery problem affected 0.1% of the 2.5 million phones sold worldwide since August -- but the problem has caused a headache for the world's largest smartphone maker. While Samsung hammered out its formal recall plan with U.S. regulators, the FAA told airline passengers to turn off the phones when flying due to the safety risk. This week, New York City's transit system followed suit. And the CPSC urged Note 7 owners last week to turn off their phones even though a replacement version had yet to finalized. Following Thursday's formal recall, the FAA revised its warning. Note 7 owners must not only turn off the device on airplanes, it said, but also protect the power switch "to prevent the phone from being unintentionally activated." Outside the U.S., Samsung has offered other solutions to consumers. In its home market of South Korea, the company says it will debut a new "battery-problem-free" Note 7 phone on Monday. It's also offering a software patch in that country that prevents affected phones from charging about 60%. The recall came at a particularly bad time for Samsung. Rival Apple's (AAPL) much-anticipated iPhone 7 debuts Friday.